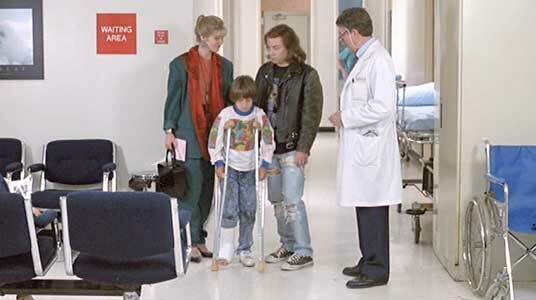 Keith Coogan and Josh Charles wears black and optical white high top Converse “Chuck Taylor” All Stars in the film. The Crandell children must figure out how to survive on their own for the summer. 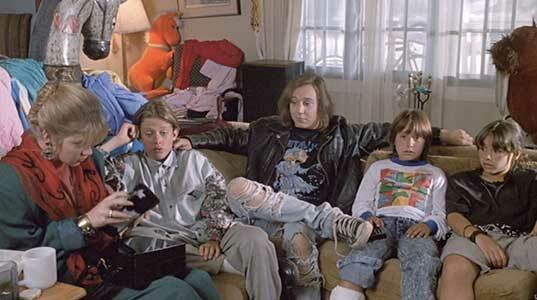 The concept guiding Don’t Tell Mom the Babysitter’s Dead is simple yet foreboding: when mom is away, the kids will play. When a mother of five takes a much welcomed summer vacation to Australia, she leaves her divergent children in the not-so-reliable hands of an elderly woman who (you guessed it) soon dies. It’s the fantasy of every child and teen – the freedom to roam wild without supervision for an entire summer. Though the celebration reaches an abrupt halt when the kids notice that their summer money was buried with the babysitter, and now they have to make ends meet on their own. When their car is stolen, Bryan comes to their rescue. With ages spanning from grade school to high school, and temperaments from tomboy to pothead, sibling bonding is out of the question as all hygiene and organization falls to the wayside. Oldest daughter Sue Ellen “Swell” (Christina Applegate), a negligent teenage diva, takes the reigns as she tries to keep her siblings afloat, or at least keep some bread on the table. Swell proves her craftiness by doctoring a resume that lands her a mid-level position at a fashion company, granting her a new air of poise and organization. Unfortunately, these new qualities don’t follow through when she learns of her access to the company’s petty cash box. Sue Ellen and Bryan become romantically involved. While Swell plays house and revels in the role of “career mom,” it becomes clear that she’s missing out on an old-fashioned, free-spirited teenage summer. In a series of unfortunate coincidences, she’s dragged into workplace drama and forced to jeopardize her relationship with a budding boy crush. Although the lighthearted film is mostly intended to be silly in nature, it truly hones in on the timeless values of family, love, and realized potential (even if it does get cheesy at times). This is exemplified as tables turn at the end of the film, as the family is called on to display their loyalty and ability to unite forces. Kenny starts to take on responsibility in the kitchen. The film’s main attribute is the constant youthful humor – either played out through the absurdity or the irony of the scenes. Angry dialogue between Swell and her burnout brother Kenny (Keith Cogan) are portrayed in an obvious “you don’t appreciate me” argument of a married couple, and the body of the deceased babysitter is simply left on the stoop of a morgue, adding to the unrealistic playfulness of the film. Camera movements intensify the humor and add an integral layer of storytelling. From close-ups of molded bread, to fast cuts in chaotic scenes, the viewing experience is very much enhanced through film direction. Don’t Tell Mom the Babysitter’s Dead is the perfect film for a laidback night, especially if you can’t decide between a comedy and a drama. The film melds both with a story that audiences of all ages can enjoy. Sue Ellen and Kenny come to the rescue after their younger brother Walter falls off the roof. 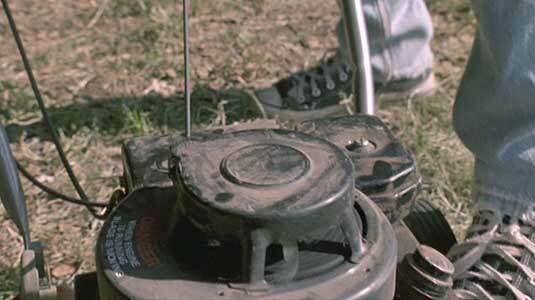 Kenny gets ready to mow the lawn. 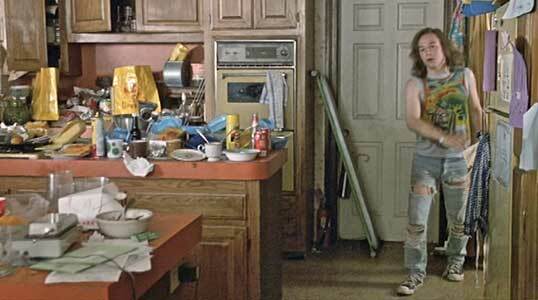 Two of the main characters in this film wear high top chucks. Keith Cogan in his role of the slacker oldest brother Kenny wears black high tops while Sue Ellen’s heartthrob Bryan, played by Josh Charles, wears optical white high tops. The best chuck scenes for Cogan occur when he begins to take responsibility at home and starts to clean up the house and property. 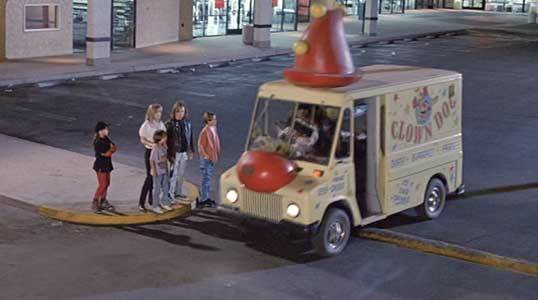 The best scene for Josh Charles, who has appeared in multiple films wearing chucks, is at the Clown Dog chicken restaurant. He helps Sue Ellen clean up a mess she makes at the fast food place where she has a job for a frustrating day and the two become attracted to each other. Bryan helps Sue Ellen clean up a mess. Don’t Tell Mom the Babysitter’s Dead. (1991) Christina Applegate, Joanna Cassidy, John Getz, Josh Charles, Keith Coogan. Directed by Stephen Herek. Categories: Comedy, Coming of Age, Teenagers.